If you want to understand modern South Africa you must understand the politics of the last century. There is no better place to start than with the Truth and Reconciliation Commission (TRC). Antjie Krog's masterwork places you in the mind of both oppressed black freedom fighters and entrenched white Afrikaner. The very pages are suffused with the people, and their struggle to come to terms with decades of Apartheid. The overwhelming need for understanding and release, or closure as American psychologists put it, speaks volumes throughout the eloquent writing in this book. If you are going to buy one book about modern South Africa, make it this one. "And suddenly it is as if an undertow is taking me out ... out ... and out. And behind me sinks the country of my skull like a sheet in the dark - and I hear a thin song, hooves, hedges of venom, fever and destruction fermenting and hissing underwater. I shrink and prickle. Against. Against my blood and the heritage thereof. Will I for ever be them—recognising them as I do daily in my nostrils? Yes. And what we have done will never be undone. It doesn't matter what we do. What De Klerk does. Until the third and the fourth generation." There is a standard problem in history, and that is of interpretation. When looking at source material from the past it is inevitable that modern morality and consensus will color opinion and understanding. The recent flock of books exposing famous characters in Africa's past as either racists or homosexuals (or both) is a prime example. Country of My Skull is an example to all those who seek to record current affairs for the future. It is a book which gives not only primary source material from the Truth and Reconciliation Commission of South Africa but also insight into the thought and morals of the people involved. You CAN judge these people from what's contained in these pages, their innermost souls are exposed for all to see. 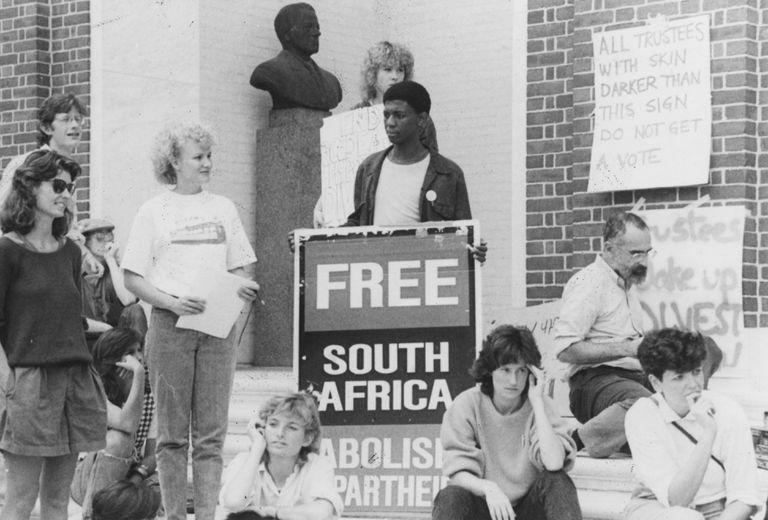 Krog has gone beyond the passive, rigid expressions of defendant and victim alike and exposed a side of South Africa not inherently available to the outsider. This book goes a long way to explaining just how the Apartheid regime could last as long as it did, it gives reason to the concept of truth and reconciliation, and it shows that there is hope for South Africa's future. The book starts with a description of how the Commission was brought in to being, with the inevitable political bickering and nail-biting drama of constitutional cliff-hangers—especially the call to extend both the period covered by the investigation and the deadline for amnesty applications. Krog recounts human rights violations, cross-examination of applicants, both black and white, for amnesty, and describes the complications on the question of reparation and rehabilitation. These represent three distinct committees within the Commission. Parallels are drawn between the continued distress of those recalling human rights violations and the empathized suffering of the Commissioners and reporters. None escaped unharmed, either through the deterioration of family life or through serious physical affliction. Archbishop Desmond Tutu's cancer was seen by many as a physical manifestation of terrors he had vicariously experienced. "You have fallen hook, line and sinker for the ANC's attempts to put the blame on the Afrikaner. And I am sorry—I will not take the blame for people who acted like barbarians, who ignored the parameters of their duties. They are criminals and ought to be punished." "The norms you are used to following no longer apply and you, alone, are now called upon to explain your actions within a totally different framework. So it is with the ... applicants. They are no longer buffered by an Afrikaner culture in power." Specific cases covered include the horrors carried out by the Vlakplaas, the Apartheid regime's death squad (although it's actually the name of the farm where they were based), the origins of necklacing in Queenstown, and Winnie Madikizela-Mandela's involvement in the kidnappings and murders committed by the Mandela United Football Club. "[R]econciliation will only be possible if whites say: Apartheid was evil and we were responsible for it. Resisting it was justified -- even if excesses occurred within this framework ... if this acknowledgement is not forthcoming, reconciliation is no linger on the agenda." Unfortunately, this expanded to a feeling that the ANC had no need to explain its actions during the Apartheid years, and that either they need not apply for amnesty, or should get amnesty on mass. Archbishop Tutu rejoins that he will resign before this will happen. The ANC causes further consternation by demanding a blanket amnesty for its more prominent members: it would be unseemly for present government ministers to be exposed to a public inquiry of their past. Great kudos is thus awarded to those who go ahead and apply for individual amnesty, especially the first to do so: Ronnie Kasrils and Joe Modise. Despite the ANC's wishes, details emerge during testimony by both victims and perpetrators of the human rights violations carried out in ANC camps in neighboring countries of Mozambique and Zambia. "There have been seventeen previous Truth Commissions in the world, and politicians have participated in none of them. How on earth did you do it?" The arrival of representatives from the various political parties to the Commission, however, puts a new slant on the proceedings. "Gone is the dearly bought language. Over months we've realised what an immense price of pain each person must pay just to stammer out their own story at the Truth Commission. Each word is exhaled from the heart, each syllable vibrates with a lifetime of sorrow. This is gone. Now it's the hour of those who scrum down in Parliament. The display of tongues freed into rhetoric - the signature of power. The old and new masters of foam in the ears." It seems that no one expects the politicians to tell the truth even when they do turn up to a Truth Commission! In the end, the Commission wasn't about recording evidence and apportioning blame, it was to allow the victims and perpetrators to tell their story; to finally allow relatives and friends the chance to grieve, and for the country to reach closure. Antjie Krog, (Antjie pronounced like an h-less hanky, and Krog like a Scottish loch) was born on 23 October 1952 in Kroonstad, Free State province, South Africa. She is well regarded as an Afrikaans poet and journalist; her poetry has been translated into several European languages and has won local and international prizes. During the late 1990's, under her married name of Antjie Samuel, she reported on the Truth and Reconciliation Commission for SABC radio and the Mail and Guardian newspaper. Despite the harrowing effect of hearing countless accounts of abuse and violence, Krog maintained a family life with her husband John Samuel and her four children. What Does the Nguni Word Ubuntu Mean?